So, what is this thing called the MBR, and how am I supposed to fix it? Defines the partition layout on the disk, including the number of partitions, their size, location, etc. This layout is essentially the map of your disk, describing where the operating system can find the boot and other partitions and structures on disk. Without this layout there there are no partitions, no operating system, no data. Maintains the Disk Signature, which helps the operating system remember the disk on which it's running. Under Windows, this allows drive letters to be reassigned to the same partition between reboots. Contains the boot code for the disk, which starts the boot process and turns control over to the actual operating system. These messages typically indicate that the boot code needs to be repaired, which normally allows the boot process to identify and redirect to the correct partition. There are a handful of software applications that have been designed to repair the MBR boot record, but most are command-line based, and can be very difficult and error-prone to use. Please note, if you aren't experienced with command line apps you may be in for a surprise. This is precisely the reason we developed MBRWizard... to provide a simple method to backup, restore, and repair your master boot record. 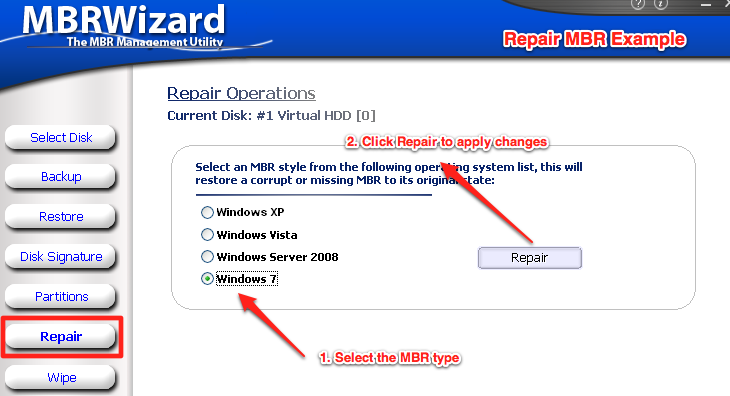 Repairing a corrupt MBR with MBRWizard requires just a few steps, and a moment of your time. To begin, start MBRWizard under Windows, which supports all versions of Windows starting with 2000 through Windows 8, including WinPE, and even Linux. Now, locate the disk with the corrupt MBR and select it as the live disk and click on repair. We are now on the Repair screen, which you see below... simply click on the MBR version you would like to use, and finally, click the Repair button. Voilà, the MBR boot code has been rebuilt to the same specs as when it was first created! 2.Graphical Windows version to make managing the MBR a breeze. MBR Repair if necessary, otherwise Protect! We are repeatedly asked, "Rather than attempt to repair unknown corruption in the MBR, wouldn't it be easier to simply restore the MBR from a previous backup?" Each time our response is the same... Absolutely! Seriously, why would anyone want to risk their data to a single disk sector that could fail at any time and destroy all the data located on the disk? Make sure you always have a safe backup of your master boot record saved to a safe location... you may never need it, but it's always better to be safe than sorry. You never know when disaster may strike due to an accident or malware attack. MBRWizard can certainly repair a corrupt MBR, but why wait until things have gone wrong and data has been lost? 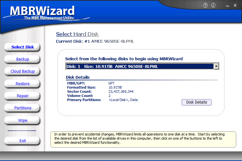 Check out MBRWizard Suite today ... and save yourself the headache of data recovery later!